It was a very mild weekend with temperatures high for this time of year and skies clear and sunny. The Japan National Team training camp in Miyazaki started off with the annual group photo -- this year the team donned the new away uniforms. This uniform has not yet been worn in a game, and will be put to the test in the upcoming game against the United States. The "katana" motif is still part of the design -- the eleven gray slashes on the left side represent the sword, and the collar is edged in red to include the rising sun red. Things got off with quite a kick, as 8,000 spectators (some reports even claim as many as 10,000) came to catch a glimpse of the team -- a record number, more than doubling attendances in the past few years of January training camp. Given the attention despite the fact that none of the European (read: "more famous") stars were part of the squad, it may be an indication of the amount of scrutiny and expectation the team should get used to as we get closer to the World Cup. Before the training began, Zico gave a 5 minute speech to the players as they formed a circle on the field. It sounds as if he will be laying on the whip a little more this year. The first day's menu consisted of one and a half hours of running-oriented drills, mostly sprints. Most of the players had already started training either on their own or with their club, so the overall fitness levels were good. But things will get much more agonizing for the guys starting today (Monday), when the physical coach Satouchi will begin to push into the cardivascular and anaerobic. If you look at the upcoming schedule in February (see bottom left column of this blog page), you will see we will be treated to four (count 'em FOUR) games next month, and traveling to and from America and Europe. The squad list will change during February, when the Europe-based players are expected to be available for call up. But I think this is a great opportunity for some of the other players who have not had as much opportunity, or are new to the squad. Point of Interest 1: The return of Tatsuhiko Kubo is probably the biggest news of the past week. He has been away from the team for way over a year, and has come back to football with what seems to be a very new attitude about things. (I will do a profile on him in the upcoming weeks and go into detail there.) Kubo is considered superior in his athleticism and most importantly finishing -- with 8 goals, he has the most goals among the forwards. Point of Interest 2: Having been off the squad for the latter part of 2005, Akira Kaji has been replaced by Yuichi Komano in recent months. It will be interesting to see whether Zico will go with Kaji or Komano for the practice/mini games, usually a good indication of who is closer to starting in Zico's mind. Point of Interest 3: Of course it is always refreshing to see new faces on the squad, and the much awaited for opportunity going to Makoto Hasebe and Hisato Sato is something that is going to add a little spice to the competition among the players. Both players are very attractive attacking players. Hasebe has shown his dribbling and creativity, and can burst forth from the midfield. How his abilities compare in the international arena is something to look out for. Sato got the most goals last season in the J1 amonog Japanese players, and fans are looking forward to seeing how his type of forward (Sato has admitted he is a big fan of Inzargi and has incorporated Inargi-like thinking into his own play) meshes with the midfielders. Point of Interest 4: The defense situation is also a little bit iffy, and I think this upcoming game against the United States will be very valuable in terms of our defenders. The system, using 3-back or 4-back, how our sidebacks do, how the centerbacks do, the communication between the back line and the midfield, whether we can compensate for lack of height, etc. The United States are a top team with an extremely high level of athleticism and finishing capability. The defenders will need to be speedy in movement and reflexes, and it will be a good way for them to measure themselves in those terms. (click pic to enlarge)Personally I am happy to see Takeshi Fukunishi back. Also, would hope that Zico gives Shinji Murai more chances on the left side. We just haven't seen enough of him in the NT to get a good sense of how he combines with the rest of the team. 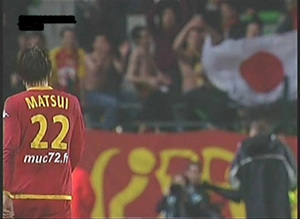 At Urawa, left side Alex Santos' position is being threatened by the acquisition of Takahito Soma from Verdy. A year ago, Soma was considered a contender for NT call up, but it never happened. His move to Reds is a curious one, and many will be eyeing the competition between the two at the club. Giving Santos a little more pressure both at the club and on the NT (with the increased use of Murai) will be I think a good thing, as he seems to be coasting a little in this past year or two. Shinji Ono will join the team on Feb 1. The group will fly to the US on Feb 5. The J league revealed the 2006 schedule of fixtures. LNZ, I know you were interested in knowing what games were going to be played, so I will email you April's list today or tomorrow. For the time being, I will post the fixture list of the first two rounds in March on the left column bottom half of the page. If you would like to know the schedule for another time period, email me. Also, the Xerox Supercup will be held on February 25 -- the league champs and the Emperor's Cup champs play, so this year it is Gamba Osaka against Urawa Reds...strangely enough this matchup is also the J1 opener game matchup as well. 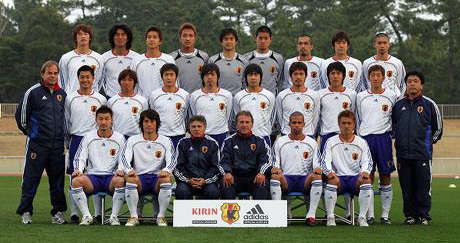 The JFA held a press conference announcing the National Team schedule of games and also the new slogan for Japan in the World Cup: "Samurai Blue 2006"
The internet voters who determined this to be the slogan of choice must have been thinking of the new National kit design, which had been based on the "katana" or Japanese sword. Though a little bit of a cliche (hey, if Tom Cruise has been there, we've done that!) it is easy to recognize from both inside and outside the country. Still, the "Soul of the Samurai" is not an unattractive imagery. 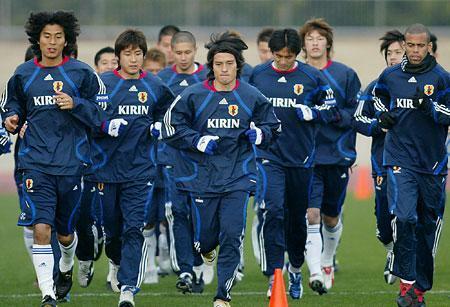 The National team will gather to start off their first camp of the year in Miyazaki tomorrow. I don't know about you, but this is my favorite time of the year...when it's all starting and coming together. All the possibilities, all the games to look forward to. And this year being a World Cup year, even more so. If any of you are interested in footage clips of the training, email me (if you are not on my mailing list already). I won't post those on the blog. Shinji Ono has been added to the roster, but will be joining the camp a few days late. 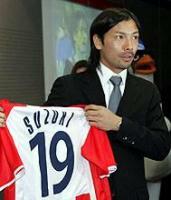 He requested a few more days to train with and get reacquainted with Urawa Reds, and Zico gave the ok. Since Ono was in the middle of his season in the Netherlands before the transfer back to Japan, he is closer to full fitness than most of the others anyway. Takayuki Suzuki has withdrawn from the national team in order to start off his new career at Red Star. The Japan National team will play in 6+3 (9 total) games before the World Cup starts on June 9th. The opponents so far are the US, Finland, India (Asia Cup qualif), Bosnia, Ecuador, and Germany. There will be two friendlies that will be played in Japan, and one other will be played in Germany right before the World Cup starts. For the two games held in Japan, it could be Scotland and Bulgaria. 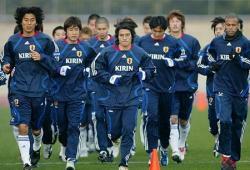 For the last game to be held in Germany, the JFA is hoping to play a strong country that will not be playing in the WC. Though the JFA has apparently gotten a slew of offers from the top teams in the world, they do not feel it would be a proper use of a valuable friendly to play a top ten team at that point. The motivation and respectfulness of the opponent would be dubious, and it would be better to play a team that has nothing to lose and everything to prove to truly test ourselves that one last time. But I'm getting ahead of myself. First things first: Will be jump starting my blog again this week with reports from the national team camp (and press conference), a summary of the overseas players games, and we'll begin to look at how each J1 team is shaping up. Winter never quite feels like "winter" until you see the first real pileup of snow. This morning, when I woke up, there it was! Though the western half of the country has been dumped with the white stuff for the past month, with about a large number of deaths related to the heavy snowfall, my area on the east has been quiet. Big fat flakes, perfect for snowball fights and snowmen on this Saturday morning though. 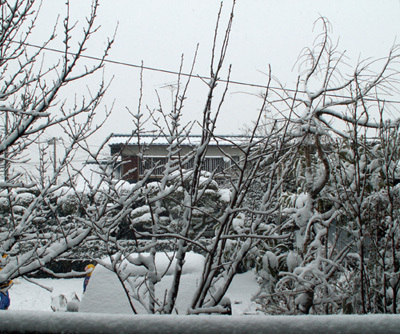 But snow is a terrible pain for people living in the more rural areas and especially dangerous for the elderly. A few days out of the year is enough for me, just to get a sense of "shiki" or the "four seasons". I've kept things quiet on the blog for the past few weeks, because alot of news is really just transfer gossip and speculation as clubs are putting together their 2006 team and several players try and negotiate transfers abroad. I also needed to take a break from football to re-energize. But in the next week I will begin picking things up again like before! It's official. Our March 1st international match day will be spent in a friendly against Bosnia to take place in Germany (match time is 3 pm local time). Bosnia-Herzegovina is ranked 65th. They failed to qualify for the World Cup, but performed well in their qualifying group with 2 draws against Spain, 1 draw/1 loss against Serbia. And having the game take place in Germany will be good logisticall, both in the ease with which the European players can join the team and in getting used to playing in Germany. The stadium is still not determined. Pre-match news, updates on National team >>Here, >>Here, and >>Here, as well as GAME REVIEW to follow >>Here. The day was originally set aside for our Asia Cup qualifying game against Saudi Arabia. But the whole thing turned into a confusing mess because the AFC did not honor their own initial outline for rescheduling and flip flopped on their own rules. It's a valuable day, given that we are allowed to call the players in Europe, and finally the entire national team can get together. The problems with the way the AFC is unable to stick to their original policy and the suspicious nature of Saudi Arabia's behind the scenes "agreement" with the AFC is enough to make me want to go off on a tirade. But I won't. The only thing I do want to note is that we have had way way way too many problems like this in the last year, with the AFC and other opponent countries not respecting their promises. 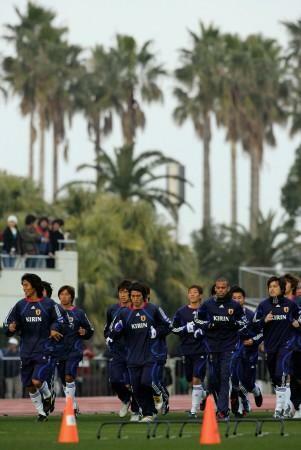 The JFA may need to carry a bigger stick or change their own tactics to one that is a bit more savvy. The Asia Cup qualifier game is rescheduled for September 1, which is not an international match day. The irony about all this of course, is that as the current Asian Champions, we shouldn't have to be playing in these qualifiers to begin with -- only this year has the AFC changed the rules.